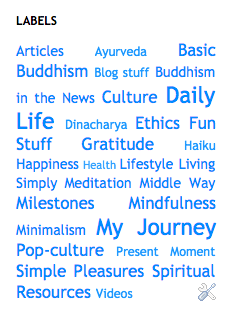 Like many bloggers, I include a label cloud on the BCB homepage to so that readers can easily peruse blog topics. 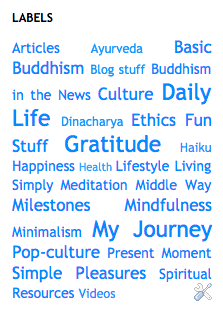 Along with "Basic Buddhism" and "Daily Life," "Gratitude" was one of the opening themes, although perhaps eclipsed by the first two due to the topics discussed in early blog posts. But since initiating this current practice, the focus on gratitude and its outward impact on my attitude and life in general has also left its mark on the 'cloud', as you can see for yourself. This post is part of the daily gratitude practice I am working to develop during 2018. You can read all about it at ByChanceBuddhism! Something unexpected happened yesterday. While organizing some photos, I found a letter that meant a great deal to me, written by a close family member upon the death of my grandfather. If you have experienced the aftermath of a house fire or other disaster that caused extensive damage to your home and belongings, you are familiar with the dreaded realization that a cherished item is gone forever. Although nothing is more important than the survival of loved ones during such hardships, loss of possessions that hold great sentimental value can also generate much sadness. After spending a lot of time excavating the scorched family home of my childhood, there were quite a few items that I just could not find. Given the condition of the house and endless piles of charred or smoke/water-damaged, and yes, still frozen belongings, this was not surprising. So many items had to be cleaned, washed, or somehow salvaged, or the pieces to be picked up and discarded. 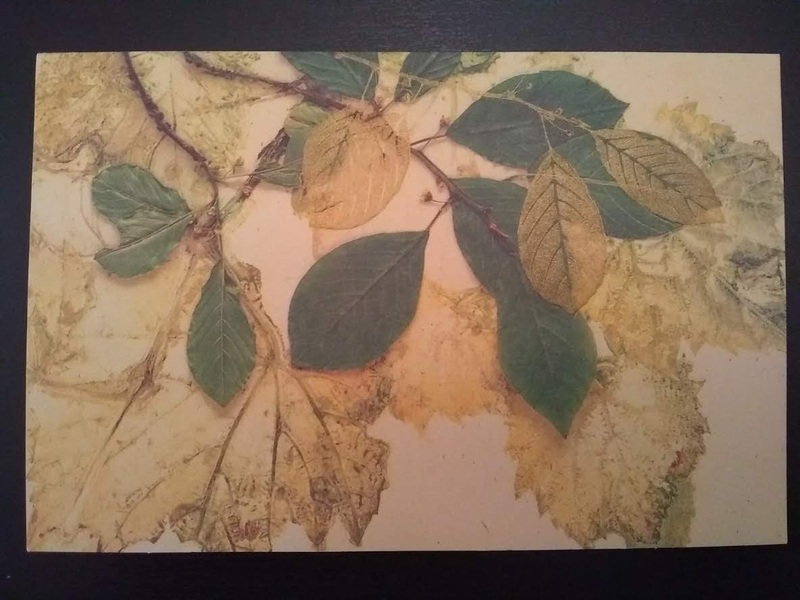 Since those days I have occasionally thought about certain sentimental items (usually a card or letter written by a loved one) and wondered if it still existed. In many cases I didn't dare to hope, and put the idea from my mind. Strangely, I know I must have opened that album many times since the fire but had not seen the letter, probably because I had assumed it was lost. Perhaps it is this type of discovery that is driving my current organizing/decluttering endeavor, not only so that I know what possessions we have, but so that I can keep those most precious to me and my family (such as this letter and others like it), closest. In closing, I will acknowledge that some may find this post, in which I express happiness at being reunited with certain possessions, confusing. Buddhism has a reputation of austerity when it comes to personal belongings, especially to those unfamiliar with the actual doctrine. Meanwhile, practicing Buddhists understand that laypeople are not forbidden from earning money and owning possessions, but we must avoid becoming ensnared by feelings of attachment to what we own. I will agree that in this post I am also recognizing my own attachment, since I felt sad when I thought I had lost something precious. But I also realize that my joy at finding these lost items is not for the sake of 'possession,' but because I feel like I have been given a second chance to cherish a lovely memory in its tangible form. And now that I know that these tangible things can be gone in an instant, my former 'attachment' can now truly give way to reverence and gratitude. I know that lately my posts have not been as numerous. I am busy, but in a different way than when I was teaching. I am productive, but often feel unproductive. I would not go so far as to say that I am 'stuck', because I definitely feel that I am moving forward on multiple fronts, albeit slowly. More correctly, I feel that this is a time for reflection and assessment, so that I can see where I stand and then change course if need be. I feel overwhelmed by household tasks, and things I need to do (e.g. wash baby clothes) seem to sneak up on me before I know it. Each day I complete many different tasks, yet I fear that few results are lasting or meaningful. Will I ever be able to get back to prioritizing my applications and professional writing in the midst of so many household tasks and obligations? I would like to spend more time each day focusing on my own wellbeing and success, and forming new habits that will eventually benefit myself and others. In contrast to last year at this time, I feel much more calm, happy, and yes, grateful. I am really happy with how this current gratitude practice has expanded my focus towards the bigger picture. I really love writing about what I am grateful for. Even if there was some hiccup in my day, being conscious of the 'good things' has really helped my outlook and lifted my spirits. Although I love expressing gratitude in my posts here at BCB, I am aware that there is still much more to do. Indeed, writing these posts constitutes 'action', but I know that there is still much more to express -and act upon- the gratitude I feel by actually doing something for someone. In that respect I am stuck, because I feel that I am not able to do anything that would be thoughtful enough. I have thanked several people in my life, but also have many more to thank. Does it make sense that I look forward to writing each of these gratitude posts, yet also find the magnitude of posts still left to write incredibly daunting? I have come to the conclusion that expressing gratitude through posts here at BCB should be extended beyond a yearlong practice. However, I do not wish to delay my thanks to people who are important to me just because I have given myself more time. I feel I am not writing posts to express my gratitude 'fast enough', and that, despite my best intentions not to, that I am help up writing the 'perfect post', especially if I am thanking a person who I care about. So there you go; a mixture of my more recent thoughts and personal challenges. For those of you who know me personally, you know that I am a problem solver, and I have already found a viable way to keep my daily tasks organized in a manageable way. In a word, it is Habitica, an online site and accompanying app that treats our daily 'to-do's and the habits we wish to develop as a Role Playing Game, or RPG. Although never a big gamer, the concept (and the fact that it is free to try!) intrigued me, and so I thought I'd give it a whirl. So far I have found that it is intuitive and useful, and yes, also innovative, rewarding, and fun! I never thought that I would be 'one of those people' who enter their to-do's into a list/calendar of sorts, but so far I love it! Researching how to keep daily tasks organized and trying a new system has given me the hope -and motivation- to start finally working towards all those things I have been meaning to do but haven't. In terms of meaning, that of the First Noble Truth is apparent; we see suffering everyday, in ourselves and others. The Second Noble Truth states that attachment/desire, selfish craving (tanha), and wishing things to be different from how they really are is the cause of all suffering. The Third Noble Truth states that the constant state of suffering we experience can cease through pursuing the Fourth Noble Truth; following the Noble Eightfold Path. To avoid an overly pessimistic view of these foundations, let's first clarify the meaning of 'dukkha.' Roughly translated as 'suffering', 'dukkha' in linguistic terms has a complex definition and thus many meanings. For simplicity, I refer to dukkha as the inherent 'unsatisfactoriness' of all things, which manifests as suffering ranging from slight discomfort to extreme misery. Reflecting further, we may realize the strong connection between impermanence and suffering. In our human experience, we know that all the things we enjoy, cherish, love, or have ever loved do not last forever. Just as our favorite flower fades, so may our connection to an old friend. Homes can burn or be washed away, and loved ones die and leave us with only memories of their presence. We also know the ultimate truth about ourselves, that we too will someday die and take leave of everything we love and have worked so hard for. Whilst interspersed amongst many happy moments, the impermanent (and therefore 'unsatisfactory') nature of all things is as real as life itself, and can be a cause for much sadness. If were are ever to be truly happy, how do we confront this potentially infinite source of suffering? That's where gratitude comes in. When we are grateful, we acknowledge that wonderful moments -and not-so-wonderful ones - will eventually pass. 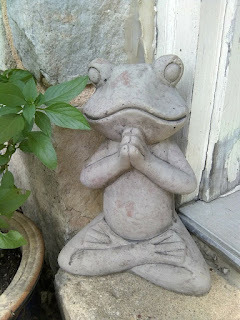 When we are grateful, we accept impermanence; there is no sense grasping things that we know will not last forever. Rather, we smile and accept all that is good in our lives with open hearts. Although we may always hope for our loved ones' safety and wellbeing, our newfound wisdom may bring our constant fear of losing them out of focus. Instead of letting our resistance to change render life's blessings unfulfilling and trite, practicing gratitude amidst the reality of impermanence makes everything all the more precious. Instead of clutching in fear and trepidation, we may embrace all that we love in the present moment with happiness and contentment. Delicate blossoms fade, transient in the cool spring air. A crisp breeze arises, and we understand the nature of change. Showered by translucent petals, we smile in the present moment.